Don’t stop driving in the cold, your horse will thank you for it! Your horse adjusts just fine to the change of temperature. How you exercise your horse will need to be changed, but you are able to keep him conditioned in cold weather. Depending on where one lives, there are options to consider as you come into the days of winter. There are those that have second homes in warmer areas that they go to. Some of those in the colder areas have access to inside arenas. Then, all the rest of us must brave the cold temperatures in order to train and exercise our horses. According to veterinarians, horses are much more adaptable to driving in the cold weather than us humans. If you were a horse, you could within temperatures up to a negative 40 degrees. Of course, your horse has a much thicker coat, so he can adjust to the various temperatures. One advantage for continuing your driving and training during the winter is that your horse will be less likely to colic. Feed and water must be accessible in the proper amounts and temperatures. When you work your driving horse you will not be running a marathon every time that you take them out. The winter training schedule will be a much calmer and quieter type of work. You need to take your time during your warm-up and cool down. 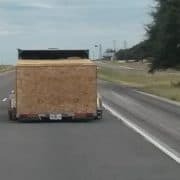 The time doing this will be longer than in the warmer times of the year. I know that with my Friesian Sporthorse, it takes me about twenty minutes in warm weather to get his muscles warmed up. So it stands to reason that driving in cold weather I need to add another five to ten minutes to it. Taking this extra time for your warmup will help prevent injuries to your horse. When you are done with your training session you will need ten to fifteen minutes of walking your horse to cool him down. Then, after unhitching, you will probably need another ten to fifteen minutes of brushing and walking your horse to help him get dried off. You need to feel through the hair down to the skin to make sure his skin is dry. The hair itself will take a bit longer to dry, but it is the skin you are concerned about. Now that you have some sort of idea about what it takes to keep your horse comfortable during the winter let’s talk about what type of training you can work with your horse in the cold. 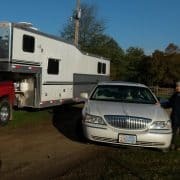 If time is short and you can’t hitch, then ground driving your horse around your property or in your arena. The horse will get exercise and so will you. If you want to do just ground driving but want to make it more interesting, then add ground poles to your bag of tricks. You can do the same exercises that you would do if you were riding your horse while ground driving. 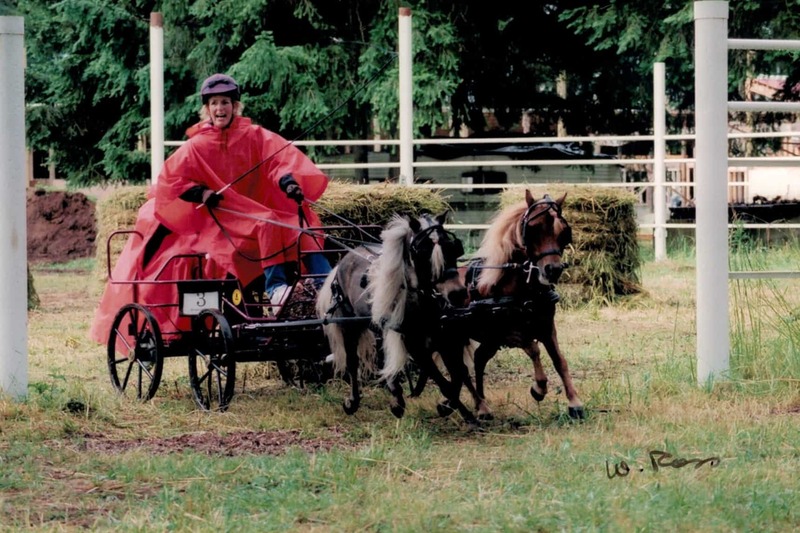 The book by Sigrid Schope called “Training and Riding with Cones and Poles” has a lot of good ideas. When you are going to drive your horse one thing that I do is I walk the obstacles that I have set up on my property. You would be surprised at how hard it is to just walk your horse. If your horse is anything like mine, he sees the obstacle and immediately wants to run. You can do the same walking of a cones course. When walking, you and your horse must concentrate a lot harder to be able to get through the cones without hitting them. Your horse needs to walk at a good “working walk” and stay focused to do the cones at a walk. 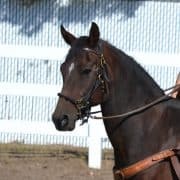 If you don’t want to bother with the harness or the cart, then you can just hand walk your horse down the street, on a trail, up and down a short incline or just around the arena. He will have just as much fun and you will have some one-on-one time with your best friend. When is the best time of day to drive your horse in the winter? You could drive them at any time, but we also must think about us humans and what we can take as far as the cold. For myself, I get cold easily, so I generally work my horses between the hours of eleven am and three pm. By eleven am, the sun is up high in the sky and we are reaching towards the high temperature of the day. Then, by three pm, the sun is getting low and one starts to feel the chill in the air. You need to find the time of the day that you can best deal with the cold to be able to work functionally with your horse. If you get to cold, then your horse won’t know if you are giving him a que or just shaking from being too cold. Besides, this should be fun for you and your horse, not a torture session! Oh, and by the way, it is okay to skip a day or two if the weather is just intolerable! “Horses are not an animal that hibernates in the winter so keep them active”. 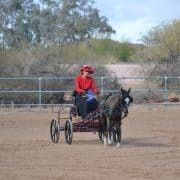 https://www.combined-driving.com/wp-content/uploads/2019/01/Eileen-driving-Sedona-and-Sonny-at-a-late-fall-event.jpg 1146 1719 Eileen Davis https://www.combined-driving.com/wp-content/uploads/2016/08/EileensLOGO2-300x84.png Eileen Davis2019-01-01 16:25:042019-01-21 08:38:14Driving In The Cold!